You wouldn’t know it was there, if you didn’t know it was there. And we don’t just mean the restaurant we’re going to write about; Charcoal Palace – Mangal Saray in Çalış. We’re talking about its location, too. Bedesten Bazaar, the little square where Charcoal Palace resides, is not the type of place that announces itself to the outside world with any sort of fanfare, song or dance to passersby. You might be one of those people who have always passed by. We were, until a few years ago. 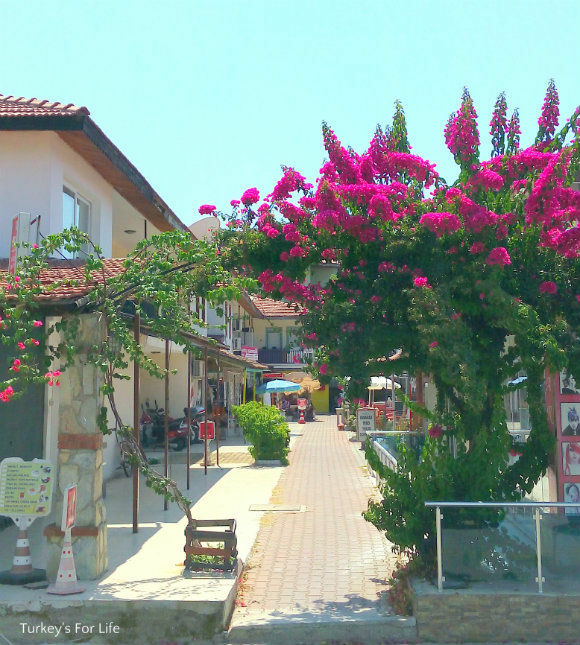 Heading along the main street leading to the entrance to Çalış Beach, not giving a second thought – or even a glance – into the sqaure that’s hidden behind those buildings. No reason to. Did we know Bedesten Bazaar was even there? Yeah – but it was just a faint blip on the radar. Charcoal Palace moved to Bedesten Bazaar relatively recently and, since then, the square has most definitely been on our radar. Overheard conversations in bars about how good the food is. Friends describing their experience – a great meal, and the size of those portions! Well, it all started to look like we were missing out. Time to join the party. Our first visit to the restaurant was with Barry’s mum and, once again, along with the likes of Sarge’s and the harbour restaurants of Çarıklı Et and good old Denizatı, this is now a place we can add to our list that has the Barry’s-mum’s-seal-of-approval. It’s not that she’s a gourmet critic or anything. It’s just that she likes what she likes and the food at Charcoal Palace suits her just fine! Where’s Charcoal Palace – Mangal Saray? We’ve seen friends on Facebook sharing photos of the food they’ve enjoyed there. “Ohhh, where’s this? Looks great,” say all the comments underneath. For lots of people who live in the area, Charcoal Palace is Çalış’s worst kept secret. So many of us love the place. If you’re yet to venture forth into Bedesten Bazaar and to Charcoal Palace, we’re pretty sure your efforts to visit will be worthwhile. Let’s start getting ready to order and tuck into some of the famous Charcoal Palace – Mangal Saray food, shall we? 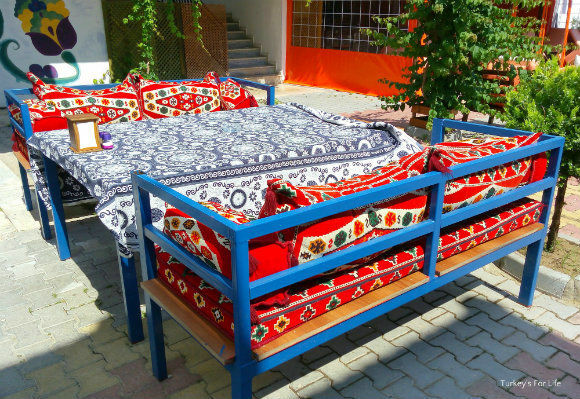 There’s traditional Turkish köşk-style seating, if you like. Don’t worry if it looks a bit hot and sunny. There’s more of this type of seating round the back, under the shade of the trees. And, if you go at night, well, it’s not going to be sunny at all, is it? And if you’re not much into heavily cushioned seating during the heat of the summer, then there are your more regular dining tables, too. Any fear of rain and you can dart into the undercover area then you and your food are not left to become a soggy mess. 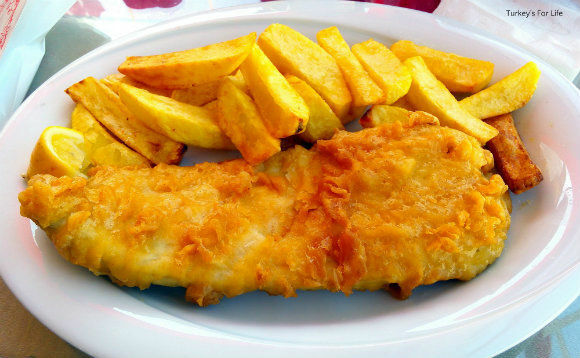 The Best Traditional Fish & Chips? You can choose between cod or pollock – cod being slightly more expensive. It’s soft and white and flaky, covered in a crisp, light batter. It’s huge. And it comes with big, fat, homemade chips. Cooked to perfection! This is the meal that drew us to Charcoal Palace in the first place. This is the meal that a lot of Brits who live in the Fethiye area perhaps talk about the most. So good are the fish and chips at Charcoal Palace, they’ve almost become a victim of their own fish and chips success. So often, you’ll hear conversations of, “Oh, we’ve been to the fish and chips place for lunch.” We’ll hold our hands up, all three of us had fish and chips the first couple of times we went. There’s vinegar on the tables. 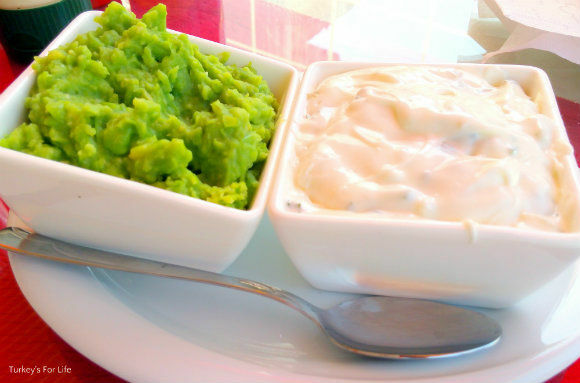 And you get a good serving of mushy peas and tartar sauce, too. When you’re in the mood, what more could you ask for, eh? Typical Brit abroad thing to do? To go out and eat fish and chips? 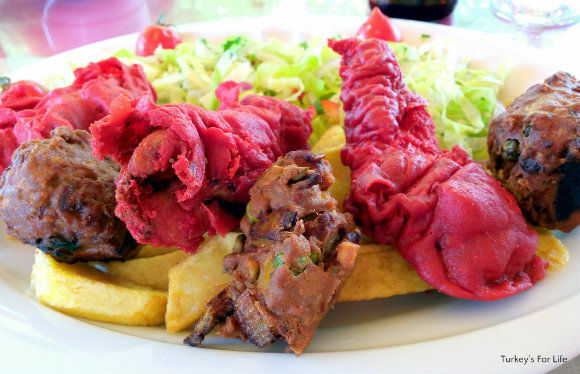 It might fit all the stereotypes but as huge Turkish food appreciators, we’re also more than happy to go out and enjoy the occasional big fat plate of fish and chips. Just like we love the occasional Indian meal too. Why not? By the third visit to Charcoal Palace – Mangal Saray, the time had come to make a bit more use of the menu before us. There’s so much more to this restaurant in Çalış than the huge plate of Britishness in the photo above. On other visits, we’ve opted for some ‘international’ choices. Charcoal Palace is also rather well known for its mixed pakora. I went for it. Another huge portion before my eyes. Eyes that said, “There’s no way you’re gonna finish all that.” The eyes were wrong – bar a couple of chips. Delicious. Tender chicken in an Indian-spiced batter along with vegetable pakora, too. Those homemade chips again. Ahh, and some light crispy salad to complement the pakora. A ramekin dish also arrived, filled with a wonderfully spicy, loose chilli dip. In the end, I gave up dipping and just poured the whole lot over the top of my pakora. Just in case you were thinking it was all about irresistible homemade chips at Charcoal Palace – Mangal Saray, the sweet chilli chicken is served with light, fluffy rice. Again, a large portion, and this was Barry’s mum’s choice. It took a while but she plodded her way through the whole lot because she was enjoying it so much. Of course, we reached over with forks and sampled a bit, too. Lovely! There’s a range of pizzas on offer at Charcoal Palace in Çalış. This was my choice on our most recent visit. A 9-inch Mexican pizza. Topped with mini meatballs and oodles of jalapeno peppers. A crisp base, not super thin but not too thick, either. And no surplus oil or grease to make the pizza floppy and limp. Each slice picked up and eaten by hand. When you order your meal at Charcoal Palace, a warm, homemade lavash bread is brought to your table along with garlic butter and ramekins filled with a selection of meze dips. 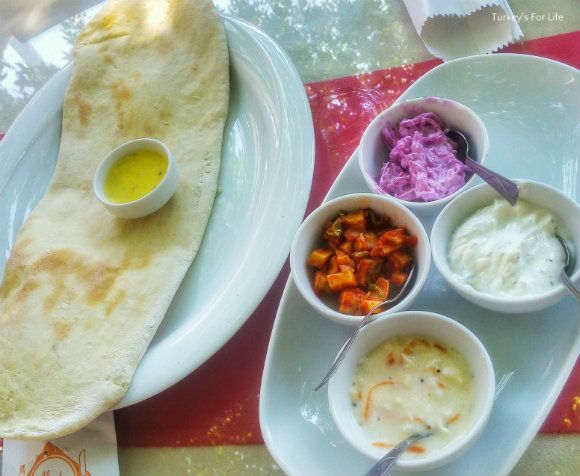 Şakşuka, coleslaw, haydari and red cabbage yoghurt are the selections in this photo. When you know you’ve got a rather large meal about to arrive at your table, it’s so difficult to resist tearing at the lavaş bread and spreading the garlic butter through the middle. Watching it melt before adding a little bit of meze and popping it into your mouth. 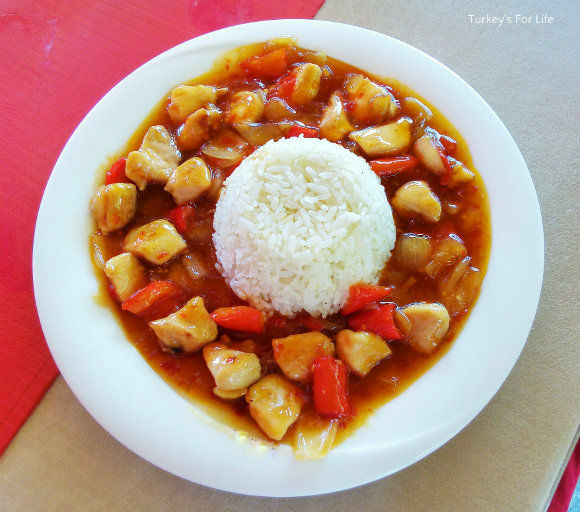 However, we have got at least one of their Turkish dishes on our list – we just need to be hungry enough when we go. The Charcoal Palace – Mangal Saray mixed grill platter for two people has gained itself quite a reputation. Köfte, various şiş kebabs, chicken wings, liver, etc. There are two options – and we might just have to try both! Well, we need a photo or two for this little section of the article! Güveç (Turkish-style casseroles), şiş kebabs, kebabs such as beyti sarma – a Turkish menu awaits those looking for the cuisine of the country they’re visiting. Charcoal Palace-Mangal Saray is in Çalış in the corner of the square of Bedesten Bazaar. Bedesten Bazaar can be entered via the marked alleyway, just off the main road (Barış Manço Bulvarı) to Çalış Beach. 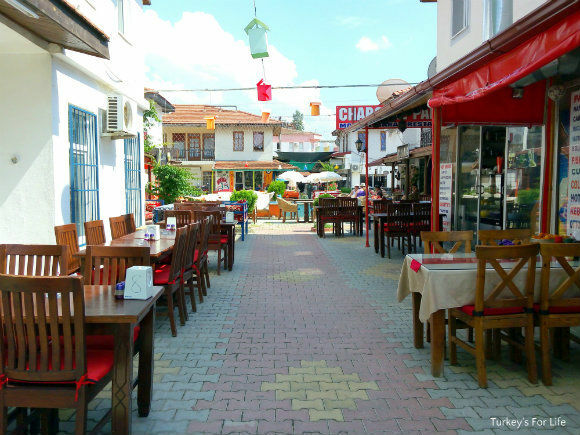 The square can also be entered next to Çalış Taxi rank and the bank of cash machines on the main crossroads in Çalış. You can also enter from the side street, 999 Sokak. Mangal Saray is the Turkish translation for Charcoal Palace. The restaurant is open daily throughout summer and shorter hours are advertised throughout the winter months. As well as main meals, Charcoal Palace also serves a range of snacks and desserts. To read other reviews of the restaurant, see photos of the food and just to keep up with events at Charcoal Palace, like their Facebook page. Take a look at our dedicated page for other ideas of where to eat in Çalış and around Fethiye.